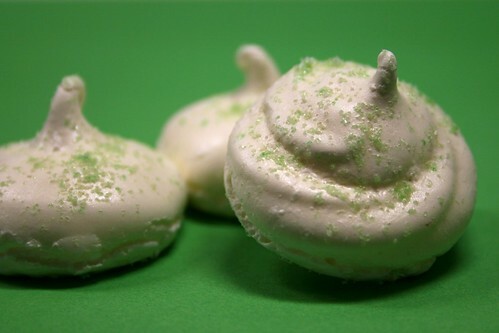 These mint-kissed meringues, dusted with a wee bit of leprechaun magic, are melt-in-your-mouth yummy -- light, crunchy and not too sweet. They're simple to prepare, though waiting for them to slooooowly crisp in the oven can be agony. The reward, however, is better than gold. This is the last day for a chance to win an e-book of our favorite spring recipes! Leave a comment today, and you're in the running! Separate the egg whites and let them sit out of the refrigerator for 30 minutes so they'll whip up well. If you don't have superfine sugar, just whir regular granulated sugar in a food processor or blender for 30 seconds or so. 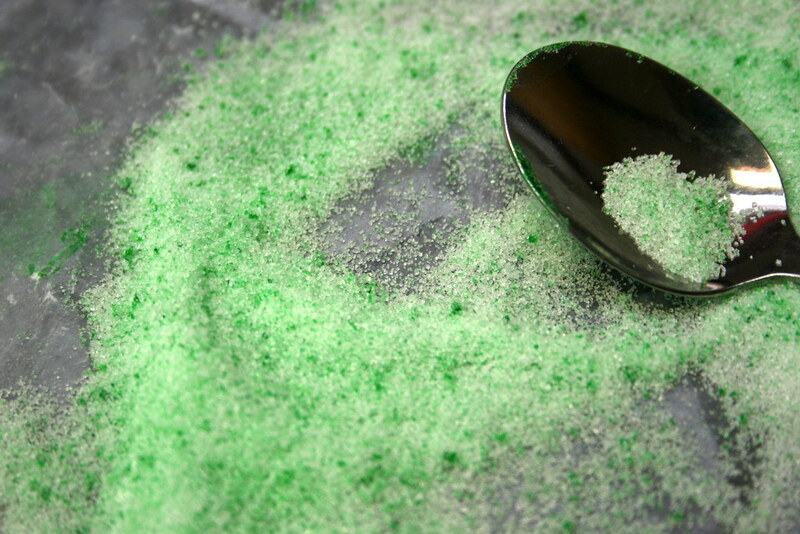 To make colored sugar, dab a tiny bit of food coloring paste onto a sheet of wax paper. Add a tablespoon or two of sugar and blend thoroughly. You could also use mint sugar -- see the variation below. Preheat oven to 225 F. In a very clean mixer bowl fitted with a whisk attachment, beat egg whites until foamy. Add cream of tartar and continue beating until soft peaks form. Add sugar gradually and continue beating until meringue is glossy and forms stiff peaks. To check that it's done, rub a pinch of meringue between two fingers -- if it feels grainy, keep beating. Add peppermint extract and beat briefly to combine. Cover a baking sheet with parchment paper. (You can use masking tape or a dab of meringue under the paper to hold it in place.) Put a large tip on a pastry bag and fill with meringue; pipe 2-inch rounds onto sheet. Alternatively, you can use spoons to form dollops of meringue. Sprinkle meringues with colored sugar, if desired. Bake for an hour and a half to two hours, rotating the baking sheet every 30 minutes to ensure even baking. Meringues are done when they are crisp to the touch. If they start to brown, turn the oven temperature down by 25 degrees. Remove from oven and let cool a few minutes before removing to a wire rack to cool completely. Store meringues in an airtight container for up to a week. Variation: I reduced the peppermint extract by half and used mint sugar. To make mint sugar, just tuck some clean, dry mint leaves in a jar of sugar. Let it sit for a few weeks, and it will have a lovely mint flavor. You can use the same technique to flavor sugar with lavender, vanilla, and more. Oh, I'm so making these for St Patty's day - I'm always at a loss for ways to celebrate this holiday - but these are perfect! Thanks! I love the mint sugar idea! I frequently make vanilla sugar, which is excellent for enhancing baked goods and coffee. Just taking another batch out of the oven for this year! Still a great recipe, and now a family favorite. Thanks, Jennifer -- so lovely to hear they're becoming a family tradition!